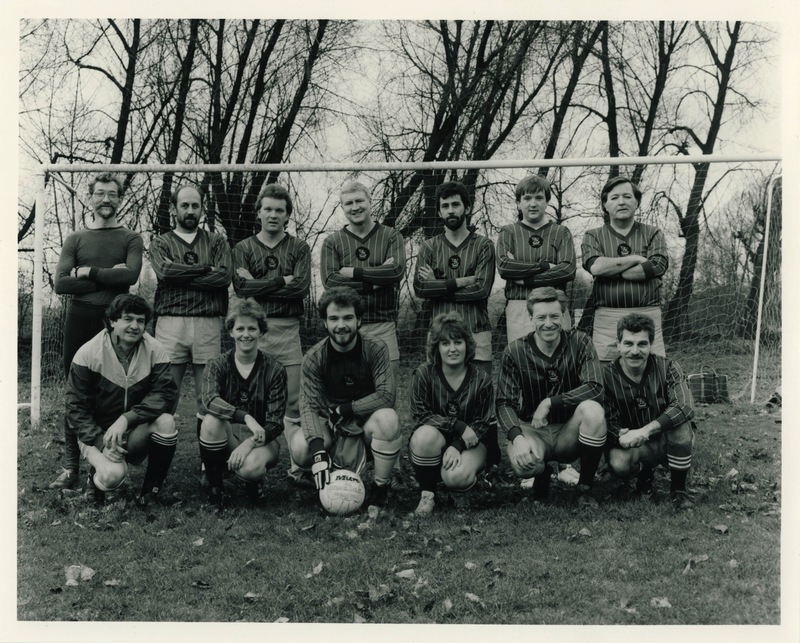 These photos are taken of the Pebble Mill football match, organised by the BBC Club, traditionally held on ‘Rum Punch Day’, just before Christmas each year. Thanks to Gail Herbert, who was Chair of the BBC Club at Pebble Mill for many years for making the photos available. The match was ‘Personnel versus the Club’. Top photo (not sure which year) were the losers, top row left to right: Colin Spears, Rick Thompson, Steve Lee, Alan Towers, Brian King, Peter Urie, Jock Gallagher. Bottom row: Paul Howell, Bridget allen, Mark Duggan, Jane Morgan, Andy Tylee, Roy Saatchi. Lower photo: Rum Punch Day Football Match 1985. 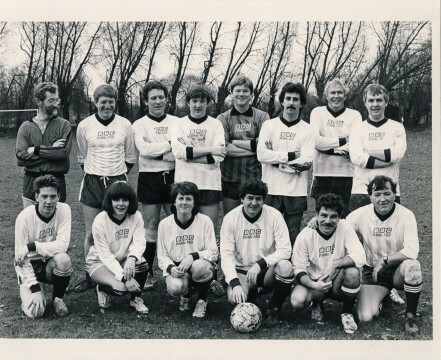 Bottom Row: Andy Turley, Mary Mallett, Mel Stevens, Paul Howell, Roy Saatchi, Jock Gallagher Row l to r: Colin Spears, Andy Tylee, Kevin Knock, Peter Urie,?, Brian King,Peter Windows (freelance producer on The Archers, then lecturer at BCU), Ted Woodhead ?. If you can fill in any of the unidentified players in the second photo, or know the year of the first photo, please add a comment. 6th along the top row I think is Brian King (as top photo but without the beard). End of top row *might* be Mick Murphy.. I don’t remember being on the losing side! However I do remember the team line-up. In the second picture it is Brian King at sixth from the left and next to him is Peter Windows (freelance, producer on The Archers and later a lecturer at City University). No 2 (from left)in bottom row is Mary Mallett (not Bernadette Kearney), then senior personnel officer. The date of the match is more likely to have been 1985 (rather than 1995 when I had long-departed from the Mill). The date of the top picture is probably later because Bridget Allen had become the senior personnel officer when she was coerced into playing! Thanks for these corrections and additions Jock. I’ll change the original post.